Arturo Vega, Hey You Fag, 1990–94. Vega’s insult paintings repeated some of the taunts the artist often heard directed his way. Curt Hoppe, Arturo Vega, 2010. The artist’s back tattoo is a variation on the Ramones logo. Arturo Vega (1947–2013) had an unusual career. Arriving in New York in 1971, Vega was attracted as much to the excitement of music as to the isolated life of a gallery artist. Luck was with him. Just as the East Village music scene was beginning, Arturo met Dee Dee Ramone, who was visiting a neighbor of Arturo’s on East Second Street. As the Ramones’ art director, Vega earned the title of “fifth Ramone,” providing the visual component that was key to the group’s success. Arturo would make the posters, direct the lighting, provide stage banners, and produce the ubiquitous Ramones t-shirt and other merchandise. Key to it all was the iconic eagle logo that Vega designed: based on the U.S. presidential seal, but substituting a baseball bat for the quiver of arrows. 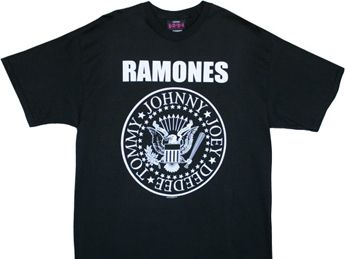 Conveying both humor and authority, the logo would not only help launch the Ramones, but also inspire later rock groups’ attention to visual branding. The little-known secret was that Vega never gave up his fine art ambitions. Despite the endless touring (he only missed two of the Ramones’ 2263 concerts over the next 20 years), Arturo continued to paint prolifically. Through March 31, Howl! 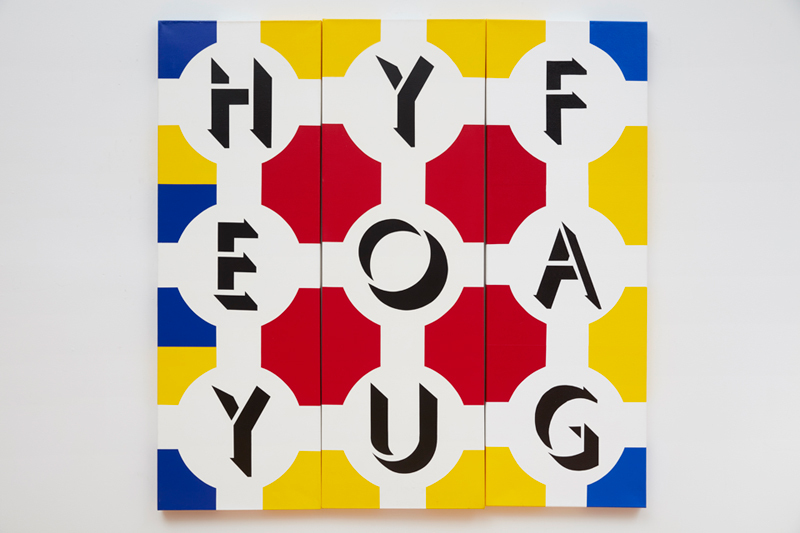 Happening at 6 East First Street is showing Vega’s series of “insult paintings”: begun in the early nineties, and rooted in the work of artists like Robert Indiana. In these paintings, bright colors and designs de-fang examples of the hurtful street language that Vega had encountered first-hand. The exhibition is a perfect counterpart to Ramones lyrics like “You’re a loudmouth baby, you better shut it up.” An in-depth catalogue is reproduced online. Vega’s prominence is growing in the ongoing pop era that has lasted from the sixties to today, in which fine art and popular culture are continually being re-mixed. Part of this larger pop-art story will be told in Hey! Ho! Let’s Go: Ramones and the Birth of Punk, opening April 10 at the Queens Museum, where Vega’s work will have a central place. Ramones t-shirt, with Vega’s eagle logo. 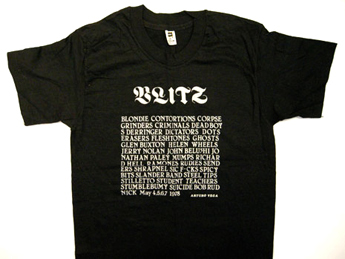 Vega’s 1977 “Blitz benefit” t-shirt lists the bands who performed at CBGB’s fundraiser for Dead Boys drummer Johnny Blitz.